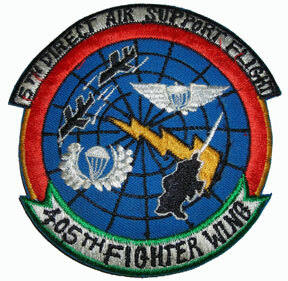 Well, first of all, at the time I served, the 5th DASF was headquartered at Clark AFB in the Philippines. I had been serving with the 1617th Comm. Sq. with the 8th Air Force at Westover AFB when I got orders to the P.I. I recall listening to President Johnson give his speech in which he said he would not stand for re-election the night before leaving. There were very few of us around at any given time because we were always TDYing. I recall the strength of the unit as being 7 FAC teams (the terminology we used) and a CO. We had MRC 107 jeeps as I recall with the turbine generator on the trailer. We were to always have a packed duffel bag and our weapons (green M-16 and Colt .38 revolver) handy in order to be able to be in the air within minutes (two hours max). We enlisted men were very independent. The pilots came and went, but we kept it all together. One very interesting assignment was to walk about 20 yards behind Gen. Creighton Abrams as he toured Manila with President Marcos. I had the little American Tourister case with "the phone". As I recall, I was told that the 5th had been at both Kadena and Naha, and was moved to the P.I. to be more central and serve as the quick reaction backup for the other DASF's. In 1969 there was another re-organization and consolidation. We came under the umbrella of 5th TAC. Although we stayed together as a group, we were actually split in two. I was assigned to the 608th TCS, and some of the guys were assigned to the 609th TCS (I believe)- but we stayed together in one building and under one acting CO and 1st Sarge. By then I was Director of Training (!). In mid-summer of '69 I was granted emergency leave to the U.S., and they mustered me out at Edwards. Hope this helps with your history. Are there any boards or forums to chat with others from the DASF's of those times? I found something called ROMAD locator which I gather is what we would be called today. I had a couple of names- chilly Glance, and Gleeful Prophet. I signed up on the ROMAD forum as Gleeful Prophet. Yea, I checked it out and the site looks good. The 5 DASF was at Clark PI. Johnson's first name was Edward. We called him Ed Johnson. Andy Anderson was the Vehicle Maint. guy. 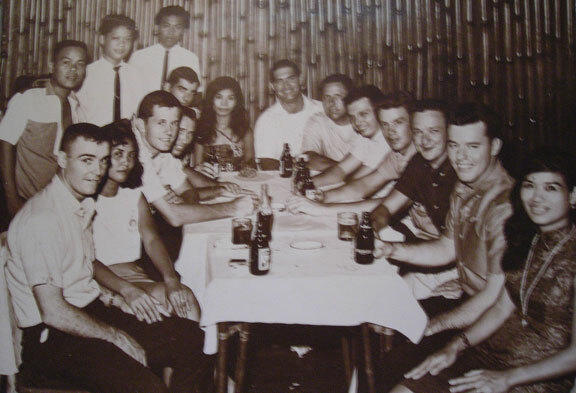 I went to the PACAF Jungle Survival School Nov 65, Class 66U. That unit Brandan mentioned in Saigon I believe was the 21 TASS called the ROAD RUNNERS. I know there were some guys with cameras and hopefully they will see your site and send in some pictures and info. Site looks good. Keep up the good work. Here are the only pictures I could find at this time. 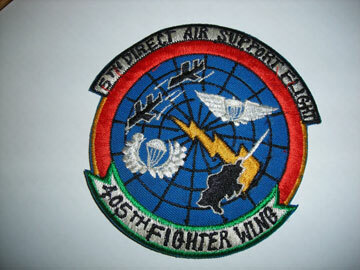 The First one (above) is a picture of the 5th DASF patch you requested. The second (above) is a picture taken at the 2nd home of the 5th DASF in the PI called the Jade Room. From right to left is A1c Ron Holder, A1c Larry Growth, A2c J. R. Richard, A1c Bill Best, SSgt Russel Jones, TSgt Richard Wallington, A1c Tom Cox, A1c John (Andy) Anderson, Unknown, and A1c Perry Keyser. This picture was taken sometime in February or March of 66. The last picture (above) was me while with the 173rd in the Iron Triangle in the fall of 65. I'm working on a complete roster of the roll call of the 5th DASF in 65 - 66. I'll send when I complete it.